Jianwei Zhou was born and raised in Zhongshan, a small city in Southern China. He graduated from Roosevelt High School in 2006. He is currently a junior at the University of Hawai’i at M?noa, majoring in electrical engineering. His current interest lies in signal processing and telecommunication. In his spare time he enjoys playing basketball, video games, watching movies and listening to music. 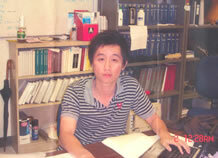 He is excited about the Akamai Internship, which will allow him to apply his knowledge to real-life practice. A deformable mirror (DM) is used in combination with a wavefront sensor and a real-time control system in an adaptive optics (AO) system. The DM is divided into 188 segments with separate control voltage to each segment. In the Subaru Telescope Laser Guide Star Adaptive Optics (LGSAO) system, high voltage amplifiers with a gain of 40 are used to amplify the control voltage to the DM. The maximum voltage for a DM segment is ±400 volts. There are 10 high voltage amplifier (HVA) boards in the Subaru LGSAO system, and each board has 20 amplifiers. When a portion of the DM is not functioning properly, it can take a long time to find the cause of the problem. To help locate faults, I designed embedded software for the HVA that measures the input and output voltages, power supply levels, and board temperature. All values can be read by a control computer in the AO system. The coding of the software is in C, and it runs on a microcontroller on the BIT circuitry of each HVA. The test software facilitates locating faults in the event of a failure of the system, and greatly reduces the debugging time.